I Dream of Genea(logy): Who are you people?!? This is my submission to the 9th edition of Smile for the Camera: Who are you? I really want to know! Well this should be easy. I have boxes of photographs that I haven't even started scanning, where many of the subjects are complete unknowns. I have a hunch or two and some clues to get me started, but getting to the actual person is going to take a whole lot of digging. The hardest part about this challenge was trying to narrow down the photo selection. Let's get started shall we? The woman in both photos is obviously the same and since they were in the same photo binder I am going to conclude this as a fact. The binder also had the studio name (for the second photo): Leonard & Co. 57 1/2 Whitehall St. Atlanta, GA. I seem to remember that while going through the Atlanta City Directories I saw several entries for Whitehall St. so if I go through those again I may find out who this family is. This entry was posted on Wednesday, December 17, 2008 at 10:26 PM and is filed under Atlanta, Carnival, Photographs, Tuggle, Wiley, Zinberg . You can follow any responses to this entry through the comments feed . Great pictures. I'm curious about their identities, too. Beautiful photographs. The man in the center of the bottom picture looks like he is wearing a tunic of some sort or I guess a shirt that is typical of the area. Very good looking bunch. I love the wedding portrait! I hope you have luck finding out the identities of these people! The bottom photo appears to have been taken in the 1940s. 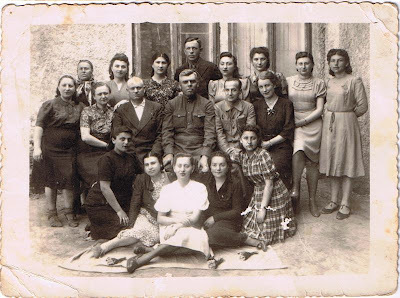 The man in the center is obviously wearing some sort of uniform, but I don't see any insignia, with the exception of possibly a patch on his right upper arm (I can't enlarge the photo enough to tell). He is not a very young man, like you would typically expect a new soldier to be, but appears to be in his 30s or 40s. Judith mentioned his top may be a tunic. I'm also wondering if the plain front of what appears to be a tunic bottom is actually the loose top front of his trousers, fastened on the sides instead of in the middle like modern pants are.